Foot pain and problems often start with a misaligned heel that tilts on impact, allowing the foot and arch to flatten, or ‘pronate’. These soft, shock-absorbing ‘wedges’ limit that motion to help relieve heel, arch and general foot pain, without taking up space in shoes. Unlike bulky arch supports, these are virtually unnoticeable. Position your Heel Straights in shoes before peeling off back, to test for placement and comfort. Make sure the inside of your shoe is free of powders or oils, so the adhesive will stick properly. 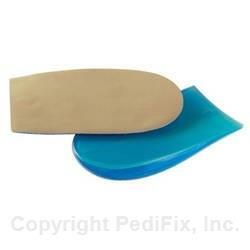 Peel off backing and press in place on top of or under insoles or shoe liners. If you have diabetes or poor circulation, consult your physician before use. If numbness, discoloration, irritation or additional pain occurs, discontinue use immediately. If symptoms persist, visit a foot specialist.